with a fun-filled buffet brunch and many exciting activities. The extravagant Easter Buffet Brunch at Nypa Café and Deli will feature BBQ, carving station, regionally inspired dishes, vibrant and colorful desserts. Guests also will be treated a wide range of free flow beverage. While enjoying this stunning meal, guests will immerse in beautiful live jazz performances with an excellent view of overlooking the serene Co Co River. Then, head out into the spring sunshine for a colorful egg hunting and painting in our resort campus and kid’s club. This year’s celebration will also include free access to our sea salt infinity swimming pool with free towels provided for all participants. 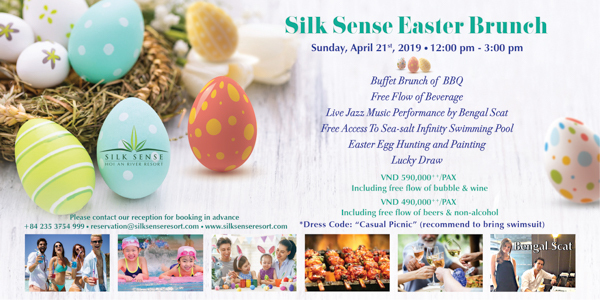 And last but not least, don’t forget to capture these moments forever with a family photo at Silk Sense Hoi An River Resort! Time: April 21st, 2019 | 12:00 p.m. to 3:00 p.m.